It has been the practice of many Akaabir and pious elders to recite the eighty durood after ‘Asr on Friday. 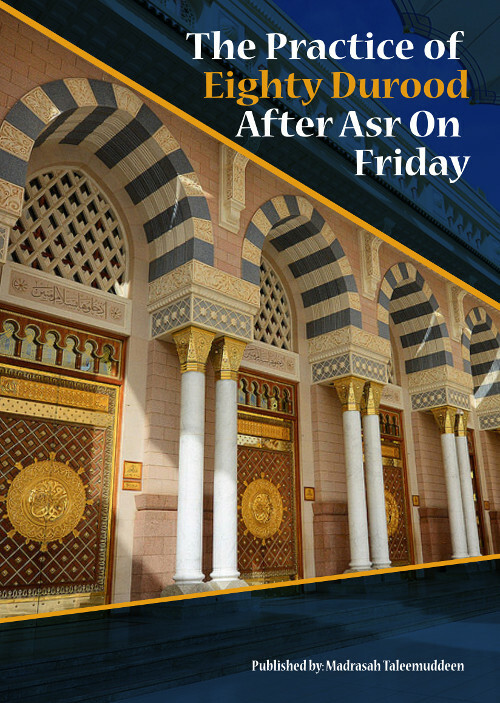 This practice was always understood to have been based upon the hadeeth of Hazrat Abu Hurairah (radhiyallahu ‘anhu) wherein he had reported that Rasulullah (sallallahu ‘alaihi wasallam) had said, “The one who performs ‘Asr Salaah on Friday and thereafter recites eighty times before standing up from his place اللهم صل على محمد النبي الأمي وعلى آله وسلم تسليماً, eighty years of sins are forgiven for him and eighty years of (nafl) ‘ibaadat are written for him”. However, there has lately been some discussion among the ‘Ulama regarding whether this practice is established and whether this durood should be recited. This book provides insight into this issue and expels the doubts that people have regarding this practice being an innovation in Deen.